A big ear with a pinkish tint around the edge; short hair indistinctly parted; grey suit, stiff white shirt with cufflinks. An umbrella is lapel-pinned to his jacket; its canopy is coloured red, green, yellow, green. The wide-cut black tie features an arrangement of dark blue umbrellas. He wears rounded rimless glasses. A sip of coffee. Shiny black shoes; he is absorbed by his tablet. Yellow and orange sunlight is creeping up into the dark blue morning sky. Grades of blue: from the yellow-blue green to shades of fish-belly white-blueness. A long cloud hangs in the sky like a blue whale. A colourful umbrella at the end of the tie matches the umbrella on the pin. The tie and the lapel-pin are a pair. One day follows the next, the wheel keeps turning. Does it leave any tracks? Does it matter? Across the aisle: a man in new-looking, light brown suede shoes, a silver ring on his ring finger, a razor cut around the middle of the jaw bone. Head forward, 90 degree angle between the seat and his neck. He has short blond hair with a fringe over the front, covering half the forehead, reaching down to the second of his four forehead wrinkle-lines, which look like distance markers. He taps his MacBook’s keyboard in short vigorous bursts. He’s working on a job advert for a “senior UX/UI designer,” for someone who can build good interfaces. The woman opposite him wears a demure flower dress with blue, white and pale pink flowers all intertwined. She is going through a set of enveloped letters. She looks up an address on her phone. Then she crosses out the address by marking the envelope’s plastic window and writes a new address next to it. She coughs very loudly and drily, not shy to use her vocal chords. She had a very English face, thin lips and a prominent thin nose. Her jowls are beginning to separate out into a distinct area on her face so she is probably touching forty-five. She wears black slippers. A black ribbon covers the tips. Her heel rests on the lip of the shoe’s back. Her coat is made up of small black and beige squares, rugged, rug-like and it is unbuttoned and hanging loosely, the tip almost touches a copy of Metro lying on the floor. Opposite me a spread-legged man with a grey sweatshirt over a red polo shirt with its collar going in all directions. The sweatshirt has a simple logo that says Hoval. He has small ears that look like mug handles when you look straight onto his face. 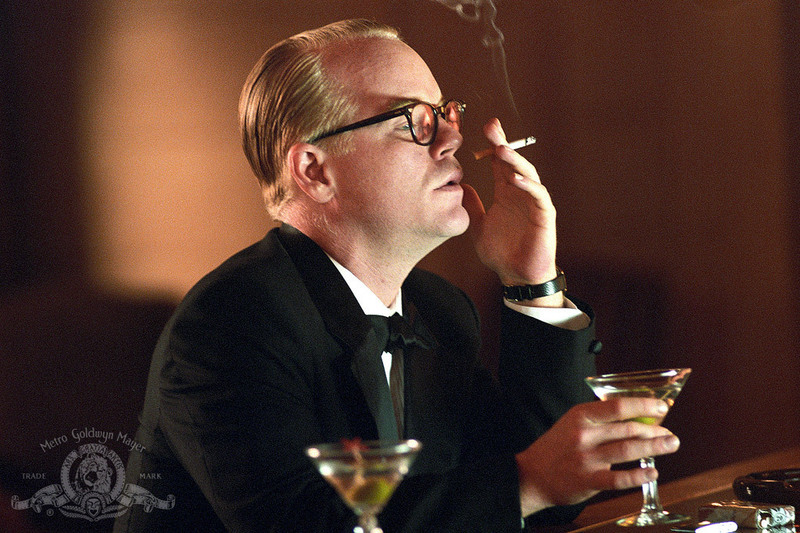 Diagonally behind him sits a man who looks like Philip Seymour Hoffman’s Truman Capote. He has Hoffman’s rendering of Capote’s sad expression on his face, gazing into his Samsung laptop. He has two wavy long wrinkles across his forehead. The man across the aisle is still working on the job advert. He’s on the “skills required” section now. There’s a logo on the template he’s working on: “Tangent.” The capital A looks like a Greek Alpha and the N is in mirror image. His head is still in a brace position. He has moved on to an advert for a “midweight UX/UI designer.” What is that? How does a flight differ from a train ride? The seating comfort is similar. Passenger activity is similar, except there is time for longer, committed interaction with a tablet or a phone — time for a film or a complete episode. The passengers who would read Metro on the train read the in-flight magazine on the plane. The level of activity is at a higher pitch. More passengers know each other. Chit-chat and engine noise and stewardesses fiddling. Flying generates a higher pitch of activity: you must book tickets, pack, travel in order to travel, pass security, get ready to board… there’s a sense of relief after takeoff and accumulated emotional energy needs an outlet. There’s a sense of happiness when a flight runs to schedule. The energy and happiness must be shared. Perhaps that explains the high-level of chatter. Train travel is part of the fabric of everyday life. The expectations for train travel are higher. The sense of relief at finding a seat and being on schedule is muted. Slowing down into the station is like a gentle exhalation. Landing at the airport is a vocalized cough. As you lose height: veins and pockets of light. Mostly darkness, both above and below. Front lights, back lights, moving lights, flashing lights, the green light facade of a petrol station, the impact at landing, the deceleration. Tall floodlights, lights on the runway for navigation. There is no equivalent of the S-Bahn in London. In London “metroisation” is a special programme. Here it is built in. How do you get reliability? By building a system to meet the requirement from the start. It’s difficult to change a poorly designed system. The London transportation network has no master planner. It’s on the bazaar side of the cathedral-bazaar spectrum. ‘The voice.’ That and no more. It is like the Cheshire cat in Alice in Wonderland, gradually disappearing, till only the grin is left. Across the aisle a man is refilling his vaping device. It smells sweet and sickly. It reminds you of Egypt. It’s the same aroma you get walking by vaping establishments where people sit on the sidewalk and inhale flavoured vapour. It’s a smell that leads to headaches. This fellow is untrustworthy. He’s foreign to the city but seems to consider himself an expert. Earlier at the airport stop he gave bad advice to English speaking tourists who were unsure about which train to take. The trains on the two sides depart to go around the city in opposite directions, but both reach the city centre in a similar amount of time. You simply catch the first train you can get. But this man told the tourist that she should choose the S1 train and get off the S8. She duly followed his advice. Another German passenger scoffed and challenged the advice but the Englishman re-asserted his false belief: the other train is at least 9 minutes faster. But you have to wait for 10 minutes to get the other train, said the native. The Englishman was about to lose his temper. His face became a bit redder, but he caught himself before getting angry with the native for questioning his bad judgement. “At least I got her off” he said and grinned and looked around looking for sympathetic guffaws. Perhaps he’s drunk. He gets up and sits back down again. He doesn’t seem to know where he is going himself. He emits noises into his private sphere. His face is quite red. Perhaps not drunk but he has had three beers. The train was stationary for a long time but an automated voice re-assured passengers that this was a scheduled stop. The engine started again, slowly revving up and the train accelerated. One difference to London is that here more people wear expensive outdoor jackets with fake-fur edged hoods. You get the sense that you’ve stepped into a fashion catalogue. Station names resonate with attached memories. A memory often begins specifically and then generalises into a gut feeling, which can fill out and move up towards the sternum if it is a significant memory and then it’s as if there’s a string of nerves tied between the pit of the stomach and the sternum with continuous activity up and down the string and at the same time specific thoughts fade in and out of consciousness. The man with the giant leather briefcase holds a sheaf of papers close to his eyes to read with his glasses on. Back in the air in a seat by the aisle. Two young women, Bavarian by their accents take pictures of the cloud cover from above: their pictures show a white bed of clouds and a blue sky. Then they edit the colour settings on Instagram. Reality has to look better than it is, has to be touched up. There is no airport taxi stand. Instead you pre-book the taxi and then you follow the driver to the car parked just outside. This is convenient, I told the cashier. He says it’s good when it works. It’s probably a mess when demand is high. Four drivers lounge on the black couch playing with their phones waiting to be picked up: a reversal of fortunes. Now the sky from below: blue, grey, green (it’s only recently that I have started to notice green in the sky), yellow, ochre at the western edges. Darker where the cloud cover is, with clouds spraying out like smoke after an explosion. And now the morning light illuminates the clouds into a brilliant red. The western edges of the clouds are blue/grey, like shadows. It’s as if the trees and fields below are burning and their destruction is reflected. The clouds are low and you can see the clear sky above them through gaps.